4-Word Review: Everybody is fooling around. 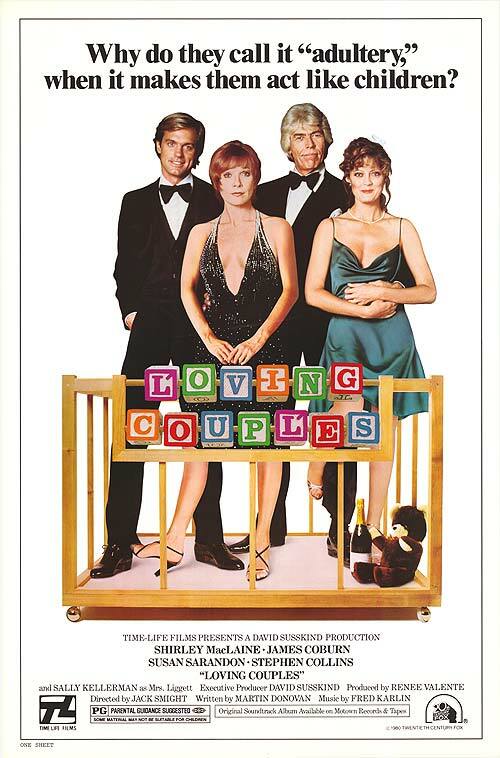 The marriage between Evelyn and Walter (Shirley MacLaine, James Coburn) has grown stale. When dashing womanizer Greg (Stephen Collins) sets his sights on Evelyn and makes a play for her she is all too happy to take him up on it. Then Greg’s girlfriend Stephanie (Susan Sarandon) finds out about the affair and tries to put a stop to it by informing Walter only to find that they have a special chemistry and soon they are in a relationship as well, but the more time the couples spend with their new mates the more they end up longing for their old ones. The flat, unoriginal script was written by famed TV-show writer Martin Donovan and is not worthy for even a second-rate sitcom. Outside of a brief amusing segment where Walter demonstrates to Stephanie how to perform brain surgery by using a hamburger bun as a patient’s cranium there is nothing much that is funny. The plot itself is dull and placid and becomes increasingly more boring as it goes along. The Greg character and how the women respond to him is a big issue. His methods at seduction could easily get him charged with harassment or stalking these days, but he is also an obvious player and yet Shirley MacLaine’s character still gets into a relationship with him despite the fact that she is old enough to know better and then ends up stung and shocked when he starts fooling around with another woman even though anyone else with half-a-brain could have easily predicted it. Stephanie’s attempts to somehow ‘win him back’ when she finds out that he is cheating on her is equally absurd since by her own admission he has already done it several times before with other woman, so why waste time trying to stop this latest fling when he’ll most likely start it up with another woman regardless? The film lacks any quarreling, which could have spiced things up. Instead when they find out about their partner’s transgressions the conversations are civil to a sterile degree, which is not only uninteresting, but unrealistic. Let’s face it all couples fight and if you can’t get into a shouting match with your spouse when you find out they’ve been cheating then when can you? Coburn manages to be engaging despite the weak material, but his curly silver haired mop-top looks better suited for a male gigolo than an otherwise staid and conservative middle-aged doctor. Helena Carroll has a few witty lines as the couple’s maid and she should’ve been given more screen time, but it was actually Sarandon that I liked the best as she plays a shy, slightly naïve character that was unusual for her. This is quite similar to A Change of Seasons, which came out later that same year and also starred MacLaine and although that film was certainly no classic it is still far superior to this one. This entry was posted in 80's Movies, Comedy, Romance and tagged Entertainment, Helena Carroll, James Coburn, Martin Donovan, Movies, Review, Richard Winters, Shirley MacLaine, Stephen Collins, Susan Sarandon. Bookmark the permalink.